Scientific American is a popular-science magazine, published (first weekly and later monthly) since August 28, 1845, making it the oldest continuously published magazine in the United States. It specializes in bringing articles about new and innovative research to the amateur and lay audience. It is a well-respected publication despite not being a peer-reviewed scientific journal, such as Nature; rather, it is a forum where scientific theories and discoveries are explained to a wider audience. In the past, scientists interested in fields outside their own areas of expertise made up the magazine's target audience. In more recent times, however, the publication has aimed at educated general readers who are interested in scientific issues. In this way, it provides a valuable service to society, educating and informing those who have an interest in scientific innovation and development but lacking the expertise to comprehend more scholarly accounts. Nevertheless, the publication has come under criticism for bias, and those in authority are challenged to maintain a sufficiently objective stance when selecting and editing articles for publication, so as to represent the diversity of opinion within the scientific community. Cover of Scientific American September, 1848 issue. Scientific American magazine was founded by Rufus Porter as a single-page newsletter, and throughout its early years, Scientific American put much emphasis on reports from the U.S. patent office. It reported on a broad range of inventions that included perpetual motion machines, an 1849 device for buoying vessels by Abraham Lincoln, and the universal joint which now finds a place in nearly every automobile manufactured. Current issues feature a "this date in history" section, featuring an article originally published 50, 100, and 150 years ago—where often-humorous, unscientific, or otherwise noteworthy gems of science history are featured. Each number will be furnished with from two to five original Engravings, many of them elegant, and illustrative of New Inventions, Scientific Principles, and Curious Works; and will contain, in high addition to the most interesting news of passing events, general notices of progress of Mechanical and other Scientific Improvements; American and Foreign. Improvements and Inventions; Catalogues of American Patents; Scientific Essays, illustrative of the principles of the sciences of Mechanics, Chemistry, and Architecture: useful information and instruction in various Arts and Trades; Curious Philosophical Experiments; Miscellaneous Intelligence, Music and Poetry. This paper is especially entitled to the patronage of Mechanics and Manufactures, being the only paper in America, devoted to the interest of those classes; but is particularly useful to farmers, as it will not only appraise them of improvements in agriculture implements, But instruct them in various mechanical trades, and guard them against impositions As a family newspaper, it will convey more useful intelligence to children and young people, than five times its cost in school instruction. Porter sold the newsletter in 1846, to Alfred Ely Beach and Orson Desaix Munn, and until 1948, it remained owned by Munn & Company. Under the second Orson D. Munn, grandson of the first, it had evolved into something of a "workbench" publication, similar to the twentieth century incarnation of Popular Science. From 1902 to 1911, Scientific American supervised the publication of the Encyclopedia Americana, which during some of that period was known simply as The Americana. In the years after World War II, the magazine fell on hard times. Three partners who were planning on starting a new popular science magazine, to be called The Sciences, instead purchased the assets of the old Scientific American and put its name on the designs they had created for their new magazine. Thus the partners—publisher Gerard Piel, editor Dennis Flanagan, and general manager Donald H. Miller, Jr.—created essentially a new magazine, the Scientific American magazine of the second half of the twentieth century. Miller retired in 1979, Flanagan and Piel in 1984, when Gerard Piel's son Jonathan became president and editor; by that time, circulation had grown fifteen fold since 1948. Donald Miller died in December, 1998, Gerard Piel in September 2004, and Dennis Flanagan in January 2005. In 1986, the magazine was sold to the Holtzbrinck group of Germany, who have owned it since. In the 1990s, the target audience changed, from other scientists in unrelated fields, to educated general readers interested in science issues. This change is lamented in an article, "The Demise of Scientific American," by Professor Larry Moran.. 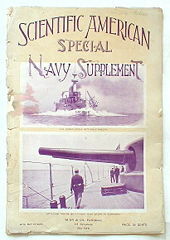 The magazine American Scientist, published since 1913 by Sigma Xi, The Scientific Research Society, which has scientifically-trained editors, includes articles written by prominent scientists and engineers, accompanied by photographs or charts to clarify or emphasize points made in the text. It covers similar ground to Scientific American, but at a level more suitable for the professional science audience, similar to the older style of Scientific American. Thus, the original audience of Scientific American has generally migrated to the more scientifically oriented American Scientist. Nevertheless, Scientific American continues to be popular; by December 2005, the publication had a monthly circulation of roughly 555,000 U.S. and 90,000 international. Scientific American published its first foreign edition in 1890, the Spanish-language La America Cientifica. Publication was suspended in 1905, and another 63 years passed before another foreign-language edition appeared: In 1968, an Italian edition, Le Scienze, was launched, and a Japanese edition, Nikkei Science(日経サイエンス), followed three years later. Today, Scientific American publishes 18 foreign-language editions around the globe. Kexue, a simplified Chinese edition launched in 1979, was the first Western magazine published in the People's Republic of China. In March 1996, Scientific American launched its own website. The site has grown into a resource that includes articles from current and past issues, online-only features, daily news, weird science, special reports, trivia, "Scidoku," and more. At the website, visitors can subscribe to the Scientific American magazine, Scientific American Mind Magazine, and Scientific American Digital, which houses downloadable PDF issues of the magazines from 1992 to the present. The Scientific American 50 award was started in 2002 to recognize contributions to science and technology during the magazine's previous year. The magazine's 50 awards cover many categories including agriculture, communications, defense, environment, and medical diagnostics. The complete list of each year's winners appear in the December issue of the magazine, as well as on the magazine's website. Scientific American Mind is a bimonthly American popular science magazine concentrated on psychology, neuroscience, and related fields. By analyzing and revealing new thinking in the cognitive sciences, the magazine focuses on significant breakthroughs in these fields. Published by Scientific American since 2004, Scientific American Mind has uncovered new thinking on dreaming and consciousness, intelligence and cognition, imagination and emotions, depression and mental illness, and perception and understanding. Scientific American also produces a television program on the PBS channel, called Scientific American Frontiers. Scientific American is a science magazine; it's largely written by scientists. We're completely dependent on the good will of working scientists for those articles, so there's a question of whether or not this could conceivably threaten the credibility of the magazine. You have to understand that creationism is sort of a shibboleth for scientists. In its January, 2002 issue, Scientific American published a series of criticisms of the Bjorn Lomborg book The Skeptical Environmentalist. Cato Institute fellow Patrick J. Michaels said the attacks came because the book "threatens billions of taxpayer dollars that go into the global change kitty every year." Journalist Ronald Bailey called the criticism "disturbing" and "dishonest," writing, "The subhead of the review section, 'Science defends itself against The Skeptical Environmentalist,' gives the show away: Religious and political views need to defend themselves against criticism, but science is supposed to be a process for determining the facts," although criticisms of scientific papers are not uncommon in academic science. The May, 2007 issue featured a column by Michael Shermer calling for a United States pullout from the Iraq War. In response, Wall Street Journal online columnist James Taranto jokingly called Scientific American "a liberal political magazine." ↑ New York Times, Paid Notice: Deaths—Miller, Donald H. Retrieved October 18, 2007. ↑ Larry Moran, The Demise of Scientific American. Retrieved January 9, 2008. ↑ Scientific American, Print Media Kit circulation statistics. Retrieved April 29, 2006. ↑ Forrest Mims, Scientific America. Retrieved October 18, 2007. ↑ Patrick J. Michaels, Who Let the Dogs Out at Scientific American? Retrieved October 18, 2007. ↑ Ronald Bailey, Green with Ideology. Retrieved October 18, 2007. ↑ Michael Shermer, Bush's Mistake and Kennedy's Error. Retrieved October 18, 2007. ↑ James Taranto, Sunk or Bunk? Retrieved October 18, 2007. Lewenstein, Bruce V. 1989. Magazine Publishing and Popular Science After World War II. American Journalism 6 (4):218-234. This page was last modified on 24 August 2015, at 16:23.